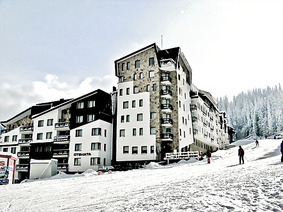 Location: "Stenata" ("The Wall") Apart Hotel is situated in "Studenets" area next to the "Stenata" ski-run. The location of the complex dives an opportunity to "Ski in and out from your door step". Accommodation: The complex offers 36 one-bedroom, 16 two-bedroom, 5 three-bedroom apartments and 7 studios. The studios are for 2 or 4 people and consists of private kitchen, a living-room, a bathroom, a balcony. Each of the apartments is luxury furnished and equipped with kitchen facilities, telephone, cable TV, fridge, heating installation, bath-tub in the bathroom. Most of the apartments are with a balcony with a beautiful mountain view. In apartments there is a possibility for two more extra beds. Hotel facilities: The guests of the hotel can use the underground parking and safe deposit box for rent. The vital shop offers day to day goods. 24-hours security for the complex. Wine & Dine: The restaurant offers traditional Bulgarian cuisine, as well as international specialties. A Lobby Bar offers various cocktails and drinks. The Cocktail Bar is the place, where you can relax and meet a lot of interesting people. Sport & Leisure: In the hotel there is a sauna and a modern fitness center, equipped with high-quality devices for all kinds of exercises.